The American astrologer, Pramod Gautam had predicted victory of Donald Trump. 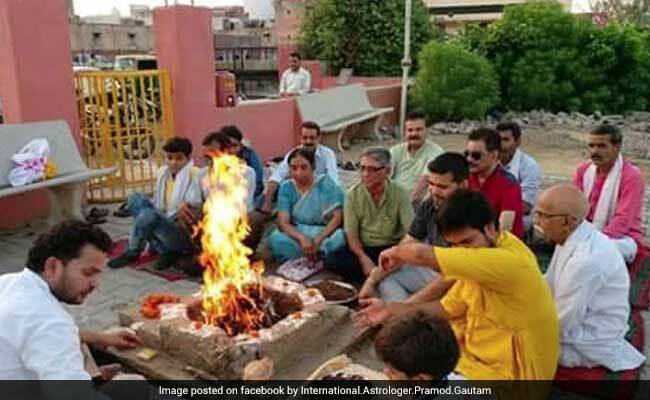 Agra: Amidst predictions of an oncoming World War by an American astrologer, local astrologers conducted a special "Shanti Yagna" at the Yamuna bank in Agra to prevent Third World War. Pramod Gautam, Chairman of Vedic Sutram told IANS: "The fear of third world war starting from May 13 had created a lot of scare after an American astrologer recently painted a grim picture following a full-fledged nuclear war involving countries from east to west. His predictions have been discussed on the electronic media in the past few days." The American astrologer had predicted victory of Donald Trump. Mr Gautam said stars in the American birth chart were placed in hostile houses till September 2017. Trump himself is under the influence of Mars. "America could face any number of violent actions forcing Trump to retaliate. Stars do not augur well and the world is placed in a highly volatile situation that could trigger off violent reactions in several theatres," he said. Mr Gautam said India's relations with Pakistan and the fluid situation in Kashmir could result in clashes with devastating outcomes. "We have therefore organised a peace yagna to propitiate the stars and seek Yamuna's blessings. Yamuna is the sister of Yamraj, the god of death." A large number of river activists and peace volunteers joined the ritualistic havan, that the faithfuls said would defuse tension building up everywhere.